Games like Little Big Planet and Braid have set a new standard for platform gaming. 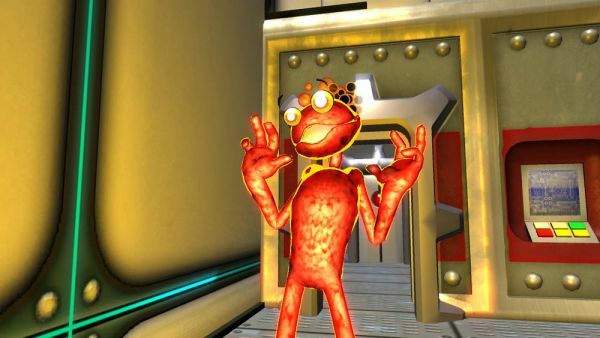 Newest to the unique platforming scene is the Xbox Live Arcade "Summer of Arcade" hit, 'Splosion Man. 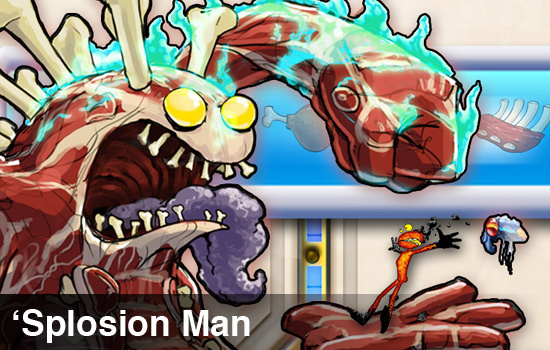 'Splosion Man has set out to do what no other game has done, by blending Wile E. Coyote antics with a wholly unique hero (or, group of colorful heroes as Co-op is meant to be.) Does 'Splosion Man pick up the torch and set fire to our hearts, or demolish our hopes with one button tap? Instead of textured environmental platforming or altering time for the one you love, 'Splosion Man will send you on an adventure of explosive revenge. Scientists do some cruel things to animals. When these cruel things blow up in mankinds face, we get a widely used pop-culture morality lesson, usually involving violence. 'Splosion Man does just that - Kind of. 'Splosion Man is the product of those cruel expiriments, who has attained the ability to explode at will. He will use this ability to track down the evil scientists and show them what's what. With 'Splosion Man, there is only one button: 'SPLODE! With this, one would almost expect the game to be a cake walk. But no, the challenge in each level comes from timing your 'splosions or leaps of faith, and controlling your trajectory. Explode near enemies to destroy them, sending robots sparking away, or blowing up scientists into bits of meat. You can also deflect projectile weapons back into an enemies face with your 'splode button! Solve puzzles by 'sploding, gain a boost to your running or jumping by 'sploding, and give a friend a hand by 'sploding! Did I mention you'll be 'splodin? ooooh, look at me. I splode! Generally speaking, the 'splosion platforming flows very well. Once you get your rhythm down, you'll be flying through levels with amazing fluidity! You'll fly through 50 challenging levels that will amuse just about anyone! You're also given a side quest to get your 'Splosion Man as hyper as possible, by stealing many cakes from within the science facility and beyond. There's even gigantic boss battles, some quite difficult or perhaps...cheap. Co-op is where this game really gets interesting with 50 co-op specific levels, and all new challenges. Puzzles that took time to figure out before, now have the additional challenge of having to coordinate with up to 3 other players. You're given a count-down clock to help time players 'splosions to get to new areas - dual explosions done correctly is very impressive, indeed! Once you get some practice in, the flow will come to you in co-op, as well - it just takes a bit more time. As you progress through stages, some players may be accidentally left behind for one reason or another. You will automatically revive that character at the next checkpoint in the level, bringing balance back to the game.